They may not move, but they are perfect on a shelf. Going out of town is always a big risk for me. Not because I drive like it's a video game, no it's because I'm a shop-a-holic. 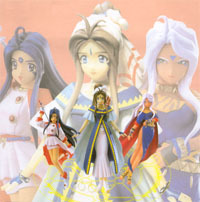 So when I saw a set of three plastic goddesses on the shelf next to an equally enticing copy of Protoculture Addict's history book, I had to make a tough decision: To buy the figures and have my monetary funds drained or to just pick up the book instead, thus, leaving my fanboy soul drained away like the time I lost an auction on eBay for a collection of comic books. If you caught the review title, then chances are you can figure out my decision. Over all these Ah! My Goddess figures are surprisingly sturdy, as apposed to the Final Fantasy IX line of figures which are prone to fall apart at the slightest touch (but they are easily put back together). This sturdiness does come at a price though. They aren't fully poseable. That isn't to say that they aren't without some movement. But, that movement is limited to ever-so-slight head turns and Skuld's twistable right hand. Movement is a small price to pay for a great center piece set like this. The figures themselves have a remarkable amount of points of articulation. Starting at Belldandy's feet she we can see she is positioned in a floating position on her toes with her foot arched upwards. Her legs end at her shin as it meets the base of her elegant hour-glass shaped white dress that sports 11 creases and prominent movement creases at the knees. At her waist is a detailed belt with hoops on it. Over the dress appears her trademark blue with yellow zig-zag seemed outer dress complete with a jewel broach at the breast line. The arms are accented with her fingerless gloves with real brass power-dampener bracelets. The dress is completed with frilly sleeves, a feather back-joiner, and long flowing outer cloth that is frozen in time in the outward position. And the package is completed by Bell's elegant hair style and silky skinned face which sports her kind smile and warm eyes. Next up is the goddess of the past, Urd who sports a majestic sideways pose that shows her clothing swaying with her movement. Urds cloths are darker in color to those of her sisters and much more skimpy which undoubtedly reviles her mischievous nature. Her navy colored dress is split all the way up her right leg which spotlights her dark tanned legs. Her feet, stomach, and breast line are augmented by her tiger skin colored clothing and her hands are complete with rings on both hands. Her white hair is highlighted by streaks of purple paint and is complete with the patented gravity defying curl which all the goddesses have. Urds face is somewhat somber in nature, all most as if she is smirking at the fact she has a sure-fire plan to get Keiichi and Bell together this time. Last up is my personal favorite, Skuld who's passion is technology and ice cream. Oh, and she's just so cute. Her pose has her left leg bent in the air as her right leg has her white, jewel studded shoes pointed down like the other girls. Being a goddess of the future, she is dressed in a more futuristic outfit which looks a lot like a modified majorette-like uniform which is finished out by a cut out front that flows as Skuld runs in her skimpy white mini-skirt. Skuld's long black hair flows outward as her face is lit up with a big smile and excited eyes. Also, because she is the only debugger of the Yggdrasil system she comes complete with the only real accessory, her croquette mallet. Each character comes complete with one of three stand fragments that, when combined, make up a complete magic circle. The character literally defy gravity through the use of a transparent curved poll which has to be forced into a hole in the back of the figures. In the case of my Belldandy, this was a very snug fit and I literally had to whittle the end of the poll to get it to fit. But, once complete, the end result is truly remarkable. Finally the packaging is your standard action figure blister pack on an individualized card board backing. The actual plastic window has the figure solely on the left side with nothing but open space to the right. The stand is glued in a separate interior plastic package to the back board, which, when removed, results in the back board's front being mutilated. Luckily, the front design is a simplistic white and yellow color scheme with the title, character name, creator info, sculptor, and then a picture of the magic circle in the top right corner. In other words, the back looks better than the front in terms of design. Speaking of the back of the package, it features a nice display of what the figures look like together with a superimposed back-drop of the figures at a different angle. Speaking from personal experience, unlike most American action figures and dolls, these figures look virtually identical to the picture. The only notable difference is the position of Skuld's mallet.